The word ‘meringue’ indicates that egg whites and sugar in some proportion are beaten together until a thick foam forms. There are four main types of meringues, two of which are used in the recipe Pavlova Paradise. Meringue suisse (Swiss meringue) is a crisp type of meringue although humidity can make it slightly sticky, and is pale beige in colour with a faintly caramel taste. If meringues are cooked at a very low temperature they will remain white; some cooks leave a wooden spoon jammed between the oven and door so that the hot heat at the top of the oven can escape allowing the internal oven temperature to remain more moderate. The egg whites are best when whisked by hand with a balloon whisk. They are whipped until smooth and shiny and stiff enough to stand unsupported in a peak on the whisk. Rotary or electric beaters do not achieve this result as well, because they emulsify the egg white and it becomes too solid. Once the eggs are stiff, 1 teaspoon of sugar per egg is quickly whisked in for less than a minute, then the bulk of the sugar is carefully folded in with a large spoon. Care must be taken not to over-mix the meringue when adding the sugar or it will start to collapse. Meringue suisse is used for small meringues that can be piped or shaped with spoons. When filling a piping bag with meringue, use a large piping bag to minimize deflating the meringue. Fold the top of the piping bag down, scoop up the meringue with a large spoon and lightly transfer it to the piping bag. Unfold the top of the piping bag and gently push meringue down towards nozzle. To pipe, keep the bag upright and gently press the top of the bag. Guide the nozzle with the fingers. Miniature meringues can be used as a decoration on cakes and gateaux and larger ones can be sandwiched together with whipped cream. To ensure two meringue halves will not separate when served, gently bash the smooth side of the meringues with the finger, to give the cream something to grip. Meringue suisse can also be piped into coils and sandwiched with cream. If filled with cream and then refrigerated, the meringue retains a thin edge of crispness and the rest softens and becomes meltingly tender. Chopped nuts, such as slivered blanched almonds and skinned, toasted chopped hazelnuts can be folded into the meringue, and the mixture can either be spooned into a high flan ring, which will help it keep its shape, or spooned into a rough round. Both examples should be put on a baking tray (baking sheet) lined with baking (parchment) paper to prevent sticking, and can be finished off with cream and fruit once cool. For meringue suisse, the proportion of sugar to egg white rarely changes from 55g (2oz) of caster (super-fine granulated) sugar per medium (size 6) egg white. The cooked meringues will keep well for some weeks in an airtight container providing there is no humidity present. They can also be frozen in a rigid container for 2-3 months. Egg whites will not whisk well in a plastic bowl, even if it is clean and appears grease-free. A copper bowl is best for meringue suisse, because the foam is creamier and more stable. A chemical reaction takes place where the egg white protein combines with the copper in the bowl to form a new protein, resulting in a more stable foam. There is also less chance of over-beating egg whites when using a copper bowl and of having them collapse; once the eggs and sugar are stiff, the meringue will hold for 15-30 minutes. If using a glass or china bowl, a pinch of cream of tartar helps the egg white to denature and will help stabilize the foam. American meringue is used to make pavlova and is found on top of lemon meringue pies, although sometimes meringue suisse is used for the latter. It has, in part, the consistency of marshmallow. 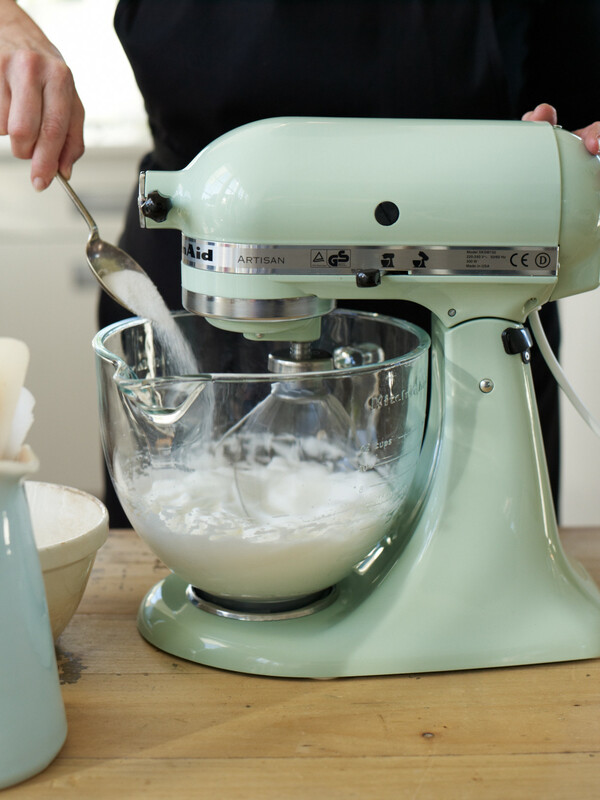 It’s necessary to use an electric beater because the egg whites and sugar combined are too heavy for a hand whisk. Cream of tartar or vinegar is added at the end to cut the grain of the sugar, keeping the meringue soft. When making a pavlova, vanilla extract is added to flavour the meringue. The pavlova is spooned out onto a baking tray (baking sheet) lined with baking (parchment) paper and very lightly shaped into a round. It’s essential to use minimal contact to avoid loss of air and deflating the foam. The meringue is then ready to be baked. It’s ready to come out of the oven when the baking paper will peel away without leaving any sticky patches. The meringue colours to a pale caramel as it cooks, and spreads very little but rises slightly during cooking. As it cools, it sinks a little and the top cracks; this is quite normal. To minimize the cracking, let the pavlova cool in the turned-off oven. The outer shell of a pavlova is crisp and slightly powdery and the inside is a dense marshmallowy foam. A pavlova will keep well for several days in an airtight container. Fresh eggs are best for meringues because the egg white is thick and traps air easily; egg white thins as the egg ages. Have the eggs at room temperature, because a warm mixture will hold more air than a cold one. When beating egg whites, the bowl and beaters must be grease-free, as even a speck of egg yolk can prevent egg whites whipping to a perfect foam. Make sure your hands are washed and grease-free so the egg white does not pick up traces of grease from your hands when you crack the eggs. If a speck of egg yolk accidentally gets in the bowl, scoop it up with a clean piece of eggshell. When separating eggs, have three bowls: a small grease-free bowl for putting each egg white into as the eggs are separated; a bowl for the yolks; and the grease-free bowl for whipping the egg whites. Transfer the egg whites to the whipping bowl one at a time as the eggs are cracked. This way, should you accidentally break a yolk when cracking an egg and contaminate the egg white, you are only messing up that one egg (put it into a separate container, refrigerate and use in an omelette or similar). Start beating on a slow speed, as the aim is to build as many small bubbles as possible. Once a soft foam forms, increase the speed. Sugar should not be added until the foam has formed, not until at least halfway through beating. Use caster (superfine granulated) sugar as it breaks down easily with beating. Coarse sugar can hold moisture and can cause the meringue to ‘weep’ after cooking. Undissolved sugar also causes meringues to weep as they cool. Once sugar is folded or beaten in, the foam is more stable. A copper bowl needs special cleaning preparation. Clean the inside of a copper bowl with a quarter of a lemon, slightly flattened, and 2 tablespoons of kitchen salt. Rub the salt around the bowl using the lemon. Then rinse clean and shake dry, or wipe with paper towels. A copper bowl must be prepared this way each time or you might find your egg whites take on a green tinge! In place of lemon, white vinegar can be used. After use, the bowl should be washed in warm water and dried. If the whisk needs to be washed in soapy water, rinse it thoroughly under running hot water to make sure it is free of detergent. Whisk the egg whites slowly to begin with, using a loose wrist motion. Once foamy, increase the speed and use an exaggerated whipping motion to incorporate as much air as possible. As soon as the egg whites are stiff enough to hold their shape on the upturned whisk, they are ready. Prolonged beating will cause the egg whites to become dry and brittle. Don’t bang beaters on the side of the bowl or you’ll knock out air; instead bang them on your hand.